As winter changes into summer, and summer into winter, you will find yourself in a transitional limbo, a between-time when nature is busily reorganizing your landing areas. Patience is demanded, but so too are your services, for everyone seems to want to get into town or out to some hunting camp, and customer pressures are high. Needless to say, this impatience must be kept under tight control, for if you succumb to its pressures you are not likely to survive for long. As the days grow longer, and temperatures rise, landing areas change their nature, sometimes in a straightforward manner, sometimes treacherously. Your main problems will be snow melting on your strips, leaving conditions where neither wheels nor skis can be used; ice breakup on the rivers and lakes; and deep mud (mostly on village strips). Snow. Under the influence of warm days and spring winds, the snow softens and begins to melt. The rate at which it melts depends on many factors, the most important being density. Hard-packed (compacted) snow will remain much longer than untouched snow. This is as true for your ski tracks as it is for the moose and wolf tracks, now little mounds of ice, that wind their way across the newly-bare ground. Since few bush strips have snow-removal equipment close at hand, whenever possible during winter I try to leave an untouched area large enough for a Super Cub on each of my strips. In this way, when breakup comes, I will be able to go directly from skis (on the hard-packed snow) to wheels (where the untouched snow has melted). In areas where drifts occur, the situation is somewhat different, for even though drifts behave the same as compacted snow (which, of course, they are), there is little you can do to control where they end up. As a result, the fluctuating thicknesses mean that once spring arrives you get to contend with bare spots alternating with melting drifts. In this case it is sometimes possible to spend a few hours with a shovel and clear a narrow path (adequate for a Super Cub or Cessna 180/185) through the drifts, thereby opening the airstrip to wheel operations a few weeks earlier. I have done this for many years at my base of operations at Spruce point. 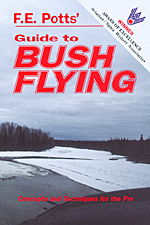 If you must attempt a landing on one of these strips before the drifts have completely melted, it is best to use an airplane on wheel-skis and go late in the afternoon when the snow is softest. The wheels will allow you to operate across the bare spots while the skis, in their "up" position, will assist in preventing a nose-over (or loss of control) when the snow is hit. Candle ice. This is ice that has gone "rotten". In the spring you get cycles of alternating warm and cold temperatures, and after a while the ice becomes honeycombed with long, thin, vertical, candle-like slivers. Because of these slivers, candle ice can easily be over a foot thick and still give way under you. From the air it has a rough, splotched look (see illustration 19); often, this telltale sign is hidden by the deep fresh snow which is a regular part of the spring weather patterns. Overflow. This problem, usually thought of only in relation to lakes and rivers, also occurs in swamps. Overflow operations will be covered in depth in the section on flying techniques (see Chapters 22 & 23). Glare ice. As mentioned earlier, glare ice is a constant problem during spring; this too will be covered in depth in the section on flying techniques (see Chapters 22 & 23). Mud. With breakup, many strips in the North turn into a deep sticky quagmire. In fact, it sometimes gets so bad they are difficult to walk across. Attempting to land on mud, pilots have been known to flip their airplanes. It happens with disconcerting regularity each spring. To alleviate this problem, a number of approaches were tried by different towns and villages over the years, ranging from steel planking to gravel overlays to pavement. The trend now seems to be to give village strips gravel overlays when funds permit, and to pave the strips of major towns. Still, for many village and bush strips (even those with a gravel overlay), spring breakup is a time of caution, and, as with "rotting" ice, the only course of action is no action until the ground drains and has a chance to dry. Since night temperatures often drop below freezing during this time of year, important flights can sometimes be made early in the morning (provided the ground is adequately frozen). Lakes and rivers freezing. When you can no longer operate on floats, that's it. You must wait for the ice to get thick enough for skis. Be careful. Do not let someone who has a vested interest in your making the flight -- your boss, perhaps, who might be more concerned with the company's bottom line than your safety, or an impatient customer -- persuade or force you into attempting a landing that you feel is not safe. Too many pilots have died, along with all on board, because of these pressures. For landing in fresh snow on wheels, using normal flying techniques, a conservative and accepted figure for maximum depth is one-third the tire diameter. It is wise to stick to this figure as much as possible. Make a slow power-on approach and let the plane settle into the snow gently. As the snow grabs the plane, it will try to raise the tail; at this point apply more power -- whatever is needed -- to keep it down. Slowly decrease power as the plane slows, but do not let the tail come up. Using this technique, I have landed a Super Cub on 25" tires in two feet of snow. Hardly to be recommended except in a true emergency, it can be done by a good pilot; the problem then becomes getting the plane out. The amount of room this takes is surprising.